My mother always made my school lunches, every single day. But every now and then, maybe once a month, she would give me money and I could go to the canteen. What did I buy every single time, a vanilla slice, this is probably the only store bought slice to this day that I love. So when I came across this recipe in a cookbook recently, I just had to make it. After the first bite I was back in high school eating a vanilla slice. This is my childhood dessert, this is something I loved. 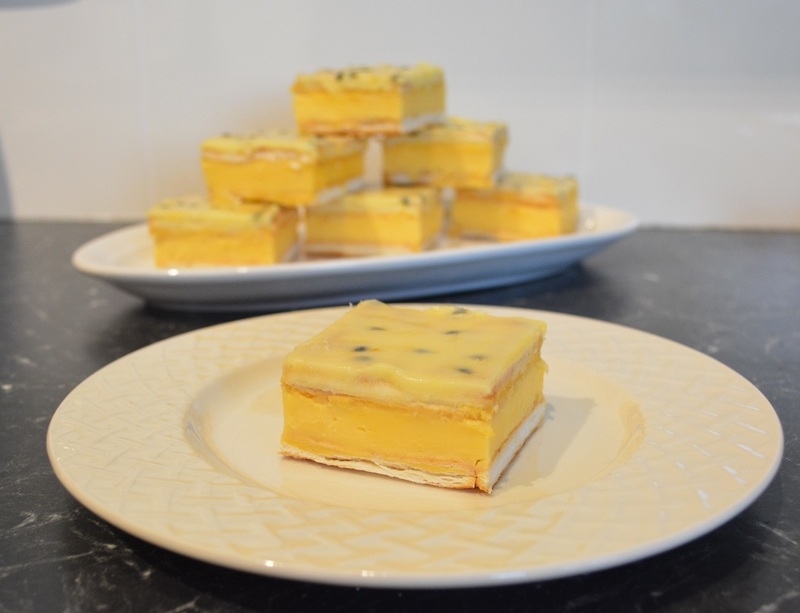 Now this is made with custard powder, some people will not like it as the custard isn't made with eggs, but I don't care, this is delicious, it tastes like a store bought vanilla slice, but by making it, it is cheaper and you get more. There is a time and place for egg based custard tarts, this is not it. I used lattice biscuits instead of pastry as it was in the recipe, but also because it would make slicing easier. The original recipe used Bingo custard powder (my mother used to use this brand when I was growing up, to make a different custard tart, another childhood food memory), but as I can no longer buy this brand I used the Foster Clarks brand. This is so easy to make, and I do mean easy, you will assemble this in about 10 minutes, then you just have to allow it set overnight. You can eat it after an hour, but I find the biscuits are a little crisp still, I do prefer it the next day when the biscuits have softened slightly. So if you are looking for a quick, easy, old school dessert, this is it. I know I will be making this again and again. Line the base and sides of a 3 1/2cm deep, 20cm x 30cm slab pan with baking paper, allow overhang along both long edges so you can pull the slice out of the tray when it has set. In the pan, arrange a layer of lattice biscuits, lattice side down, in a single layer, to cover the entire base. Cut the biscuits, if needed, to fit, with a serrated knife to ensure entire base is covered. In a medium sized saucepan, add the custard powder, sugar and 1/2 cup of the milk. Whisk until smooth, you really need to get rid of all lumps here. Pour in the remaining milk, cream and vanilla, whisk to combine. Place the saucepan over a medium heat and cook, stirring constantly, for 5 minutes, or until the custard just comes to the boil and it has thickened. Working quickly, as you don't want the custard to set before you sandwich on the second layer of biscuits, pour the hot custard over the biscuits in the pan and immediately top with another layer of biscuits, lattice side up, making sure you line them up with the biscuits on the base. (If you don't work quickly here, the top biscuits may not stick to the custard and will come off when slicing). Refrigerate for one hour, or until set. For the passionfruit icing: sift the icing sugar into a microwave safe heat-proof bowl. 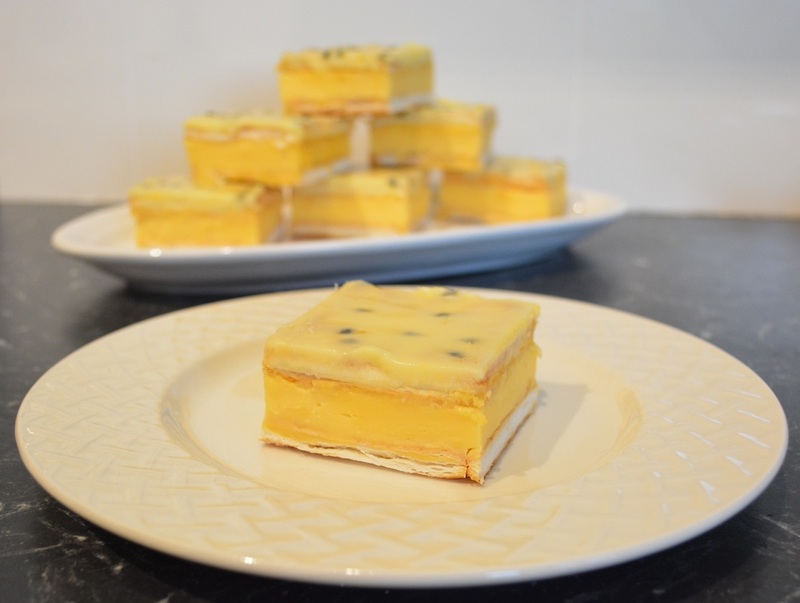 Add the butter and enough passionfruit pulp to make a very thick icing, I added the 2 passionfruit. Microwave, uncovered, for 40-50 seconds on high/100%, until the icing is warm and runny. Quickly, as the icing sets quickly, pour the icing over the vanilla slice and spread it out over the biscuits. Refrigerate for at least an hour, but I prefer overnight. To serve, cut the slice into squares, using the shape of the biscuits as a guide.